And if we compare the relative usage, when we factor Japan’s total population of 127 million, we get 19%, which basically means that there is a huge opportunity for growth and companies need to start working on an Instagram strategy. 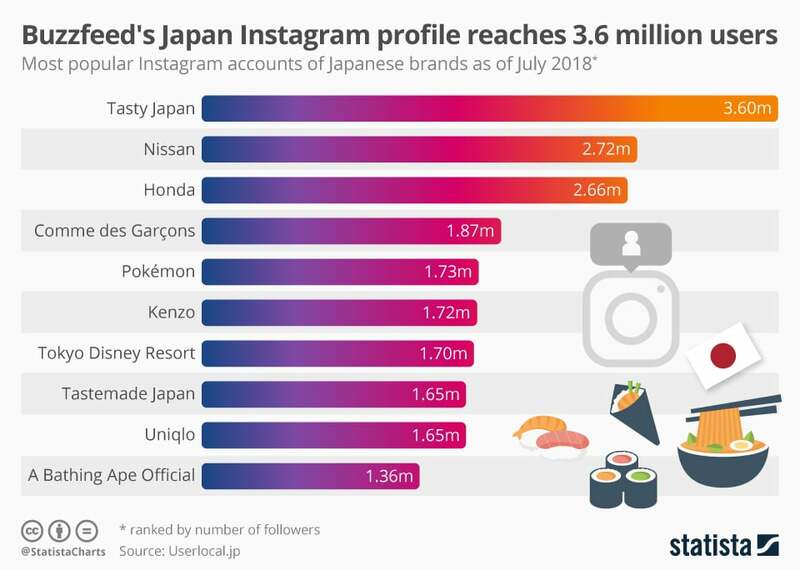 To understand the current landscape and how brands in Japan engage with their audience on Instagram, we’ve analyzed the top 10 companies according to the number of followers. Now, let’s breakdown few of the Instagram profiles. The idea is to see how they have been using Instagram so brands that are in the similar niche market or industry can learn from this and ‘re-use’ some of their tactics. These brands are definitely a great source of creativity and examples how the latest marketing trends in consumer engagement are performed in real life. Tasty Japan is a brand developed by BuzzBase to showcase their cooking platform in Japan. Tasty was founded back in 2015 and quickly became a sensation, as it is now producing some of the most popular digital content in the world. CEO – Make a business out of massive intellectual property that was built digital-first. Increase video views, communicate link in bio to drive traffic, place products in videos. They also ask their audience to tag them using #tastyjapan hashtag when they try cooking the same food by themselves as a credit for their effort. They cross-promote the content to Youtube channel and they feature the latest content/video produced by the Tasty Japan team. Yes, Tasty Japan uses Instagram Stories. Tasty Japan has highlights, using the “see more” option. In the first case, they use Instagram Stories to show behind scene action where their audience can see how Tasty Japan staff produces the videos and if they want to see more, they are redirected to their Youtube channel. In the second Highlight, they feature a picture of their products and again they redirect their audience if they want to see/learn more to their website. When someone clicks “see more” they land on their website where they can see Tasty Japan running a promotion and giving away 20,000 Yen product for which their audience needs to follow 3 steps to be eligible for the reward. First they need to follow their official Twitter and Instagram account, second, they need to make their own food/recipe and take a picture and third, they need to post that picture on Twitter and Instagram using the #tasty japan second-anniversary hashtag. In both cases they use UTM tags, so they can track the success of their campaign. Yes, they have in total 8 videos. The shortest video is 5 min and it’s a beautiful story told by an older Japanese lady related to the famous Japanese tea ceremony. The other videos are in the range of 5 min and 9 minutes and they feature behind scene action from the Tasty Japan producers where their audience can see how they prepare the videos. There is also one sponsored video by rizap collection. In this video, Tasty Japan teams up with rizap collection to produce a video where they cook food together and the representative of rizap collection talks about one of their products. They also have a link in the video that redirects views to rizap collection online shop. They use photos and videos but they are famous for their videos. They also do cross-promotion as you can notice the same content on their Youtube channel and on their Facebook page and Instagram account. They become famous by using video as a format that is rarely more than 1 minute, the narrative is fast and there is no need for audio. They use background music to make it sound more natural and fun and they write the recipe in the caption and they actively use hashtags. The unique approach of Tasty is the way they produce the videos. They have a “full-stack” production model i.e. their producers are creating every part of a video. Starting from recipe origination to shooting and editing the videos. Usually, the one to two videos per week is produced by a single producer. Their approach for sourcing ideas comes from their audience via viewer request or comments, they check and look for recipes that are trending and compare that with what performed well in the past. Provide English language translation embedded in the video. Lot’s of their fans are out of Japan and having English subtitles will add value to their viewing experience and bring closer Tasty Japan to their international audience that is following their Japanese Instagram account. 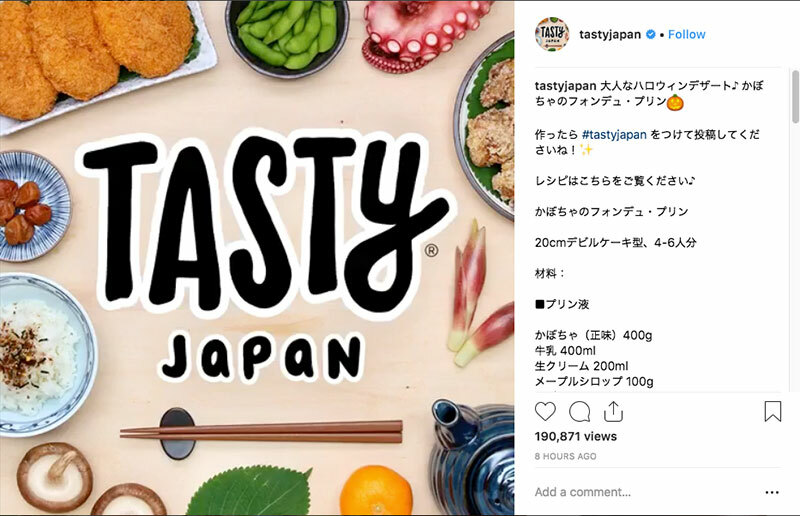 On average, TastyJapan for each post they have on their Instagram account, they get, 30k-60k likes, 50-300 comments, their videos reach 300l-600k views and they post on average 16 posts/per week. Are you an Instagram Creator? Try EmbedStories – #1 Instagram Stories platform, fetch, manage and display your Instagram stories on any website with shoppable links. Request a demo and engage with web visitors beyond the Instagram app. Nissan is a Japanese multinational automotive company famous for selling cars under the brands of Nissan, Infiniti, and Datsun. Since 1999, Nissan is part of the Renault–Nissan–Mitsubishi Alliance, a partnership between Nissan of Japan, Mitsubishi Motors of Japan and Renault of France. They use Instagram so they can showcase their latest car models, innovation leaps into electric vehicles and electric batteries and forge long-lasting relationships with their audience. They use, Instagram Stories, user-generated content, Instagram features, hashtags and they maintain 10+ different Instagram accounts that are specific to countries and continents/regions. They use a bio link to promote the newly developed Nissan GT-R50 developed in partnership with ItalDesign. They also accept features via DM asking owner and photographer information for credit. Yes, they have Highlights, currently, they have only one category, posted 12 weeks ago. It features the new Nissan GT-R50 model designed in partnership with Italdesign. They use “see more” / “ swipe up for more” Instagram Story feature which leads their audience to the official website of the new car model. Yes, currently Nissan uses IGTV and they have 3 videos in total. All videos are around the 1-minute mark. One video features highlights of the Nissan NISMO team competing at the Spa 24 hour, hashtags they use are #Spa24h #NISMOnation, #OMGTR. The second video features the new car model Nissan GT-R50 by Italdesign where they show highlights of the Spa 24 hour in Belgium where the new car model took the first lap around the track, they used only one hashtag for this video, #OMGTR50. The third video is promotional and features again their new car model Nissan GT-R50 and again using the same hashtag #OMGTR50. The most used hashtag is #Nissan. They follow a pattern where most of the posts on their Instagram account features user-generated data. Nissan asks their audience, most of them which own Nissan cars to take beautiful pictures and send them to Nissan. The hashtag pattern they use is 3 to 4 hashtags. For example, they use a hashtag where they write at the beginning #NissanJuke, as you can see it’s Nissan followed by the car model. They also, in the same posts featuring USG photos, they use the #Nissan hashtag and they also use only the car model hashtag, #Juke. Sometimes if the car model is very popular like Nissan 350Z they use the #Zociety hashtag i.e. the most popular hashtag that comes from the Instagram community. Their content mostly features beautiful photos takes from their audience. They put emphasis on user-generated photos by enticing and celebrating their love for Nissan as they post the photos on their official account. The also use IGTV i.e. videos where they showcase their premium car model GT-R50. They also use Instagram Stories as they feature behind the scenes action from their promotional events and conferences Nissan hosts around the world. Their most active account using Instagram Stories is the European one @nissaneurope. 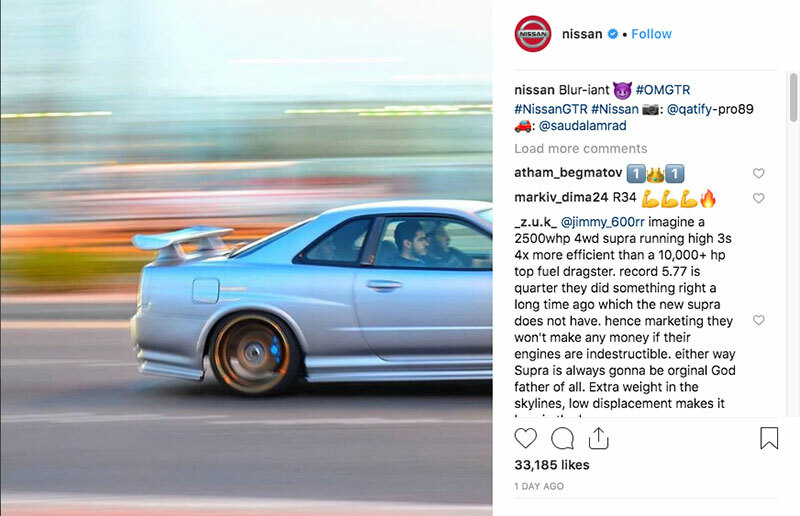 Nissan maintains 10+ different Instagram accounts to capture and connect with their audience depending on the geography or market they are present. This approach allows them to communicate in a different language with different content with the local audience to the content is mostly user-generated. In addition, they maintain one global account @nissan where people from all around the world follow them. Finding: Nissan fully leverages all features available on Instagram and maintains several accounts. On average, Nissan for each post they have on their Instagram account, they get, 10k-70k likes, 50-200 comments, their videos reach 20k-40k views and they post on average 18 posts/per week. Honda is a famous global brand originating from Tokyo, Japan. Honda is the world’s largest motorcycle manufacturer since 1959 as well as the world’s largest manufacturer of internal combustion engines measured by volume. They use Instagram so they can showcase their latest car and motorcycle models, their latest innovation to build a global community around Honda. They use, leverage Instagram features to the max, featuring Instagram Stories, user-generated content via hashtags etc. Honda maintains several different Instagram accounts that are specific to countries and continents/regions, also they have Instagram accounts that are specific to iconic car models such as Type R, and racing teams associated with its motorcycles. Honda uses the bio link to promote its new car model for the US market, Honda Insight. Yes, Honda uses Instagram Stories. They have 3 active Highlights, in the first one, they feature the new Honda “Sensing Insight” which is a suite of safety and driving assisting technology. It’s a beautiful cartoon-like Instagram Story showcasing the key features/benefits that new model owners can expect once they purchase Honda car models. In the second group of Instagram Stories, they feature the most frequent cases when driver attention is being tampered with the driver’s desire to use the mobile phone while driving. The punchline is “When your attention is on your phone, you miss what’s happening on the road” followed by a hashtag #RemoveTheDistractions. The third group of Stories features a live demo of the new 2019 Honda car model Insight. #hondalove is their most used hashtag. It features user-generated photos, photos taken by Honda car owners around the world. They have a great copy above the bio link “Remember to show us your #hondalove. Their usual game plan is to use the car model or motorcycle model name as a standalone hashtag and sometimes they combine that with a hashtag that is related to some holiday for example #BrakeSafty. Also, they combine the car model hashtag with a new technology developed by Honda and embedded into the new car model. For example, they use #HondaClarity featuring the new Plug-in Hybrid. #MeandHonda #photo #honda #honda_colorgram are the most used hashtags. In Japan, Honda’s official Instagram account features mostly user-generated content encouraging their audience to use the #MeandHonda. They also use Japanese language hashtags such as #写真 #クルマ which mean picture and car, followed by hashtag with the car model name. Honda is all about user-generated content and beautiful photos. They put emphasis on car and motorcycle owners of Honda by encouraging them to post photos and use specific hashtags if they want their “baby” to appear on Honda’s official Instagram account. 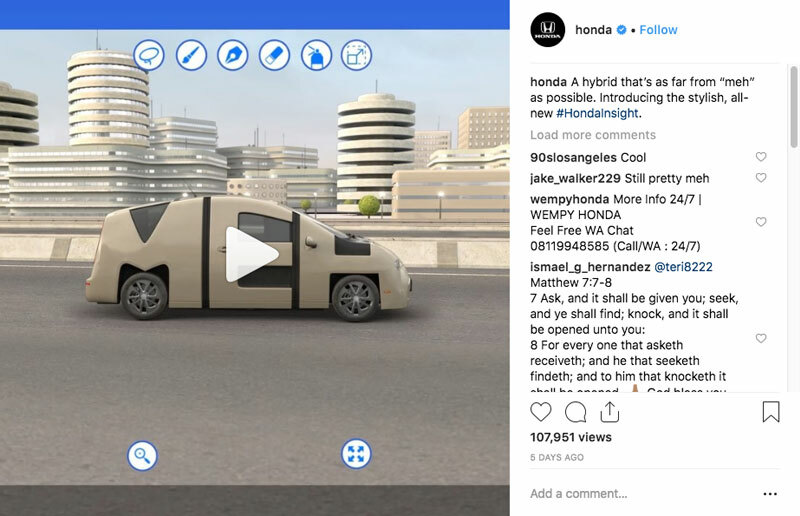 On the Japanese Instagram account, in the bio link, Honda redirects their audience to the official guideline on how they disseminate user-generated content. They don’t use IGTV. They also use Instagram Stories as they feature behind the scenes live demo of their new car model Honda Insight, they run a campaign to promote responsible driving and they feature the benefits car owners can expect from their new “Sensing” system. Honda’s unique approach lies in their commitment to put emphasis on user-generated content. All of their Instagram accounts, feature USG as Honda communities around the world are big considering Honda’s reputation and early success. Honda uses all features available on Instagram except for IGTV and maintains different accounts depending on the geography and product lines. On average, Honda for each post they have on their Instagram account, they get, 10k-50k likes, 50-300 comments, their videos reach 70k-150k views and they post on average 2 posts/per week. One of their latest Instagram posts with Naomi Osaka wearing Comme Des Garcons outfit. Founded back in 1973, Comme des Garçons is a Japanese fashion brand managed by Rei Kawakubo. It is based in out of Tokyo and also in the Place Vendôme in Paris. Comme Des Garcons uses Instagram to build a community around their brand. Their most frequent approach is featuring photos from their activities and the latest designer clothes. Comme Des Garcons uses the bio link to promote to redirect their Instagram audience to their website. #コムデギャルソン – this is the name of the brand in Japanese. Comme Des Garcons most used content are photos. They focus on branded content exclusively without featuring user-generated content on their official Instagram account. They also don’t use Instagram Stories nor IGTV. Their unique approach is to showcase photos from installations that are sponsored by Comme Des Garcons around the world. Usually, it’s a reflection of art, paintings, and sculptures combined with a new collection from the brand. They also feature pictures every time they open a new store in a new location, when they have a new collection or when they do a collaboration with a famous magazine. The photos follow a familiar pattern where credit is given by tagging the account of the person who took the photos, the make-up artist, the art director, the publisher, and the model, the one who is wearing the clothes. 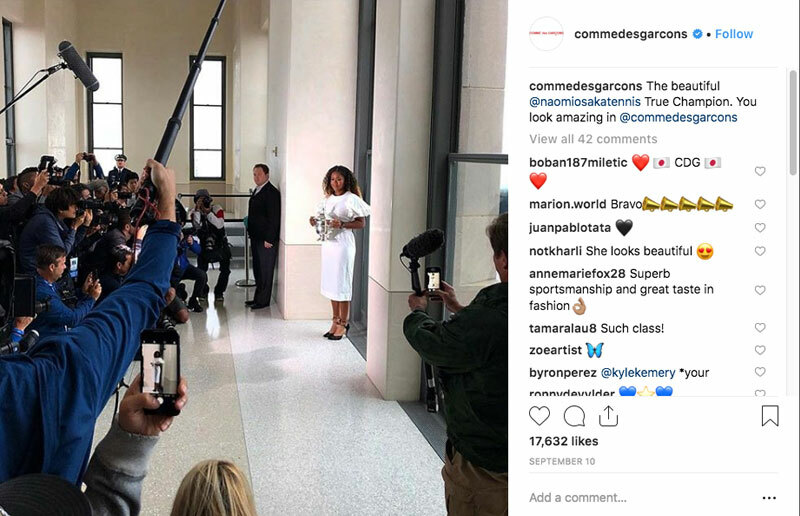 Comme Des Garcons doesn’t use branded hashtags, nor does it use Instagram Stories or Instagram IGTV. This means that there is huge potential for them to be discovered by other people with similar interest like their original fans and audience. The same goes for Stories, if they start using Instagram Stories, the brand can expect, more engagement and more fans the minute they do this. On average, Comme Des Garcons for each post they have on their Instagram account, they get, 10k-70k likes, 50-300 comments, they don’t use videos and they post on average 1 post/per week. Pokémon a Nintendo owned trademark, is the highest-grossing media franchise of all time, with over $69 billion in revenue up until March 2017. It includes the world’s top-selling toy brand, the top-selling trading card game with over 25.7 billion cards sold, the second best-selling video game franchise (behind Nintendo’s Mario franchise) with more than 300 million copies sold and over 800 million mobile downloads. Nintendo’s most famous brand Pokemon is ut there with it’s Instagram account to build an Insta community around the game and promote their latest news. 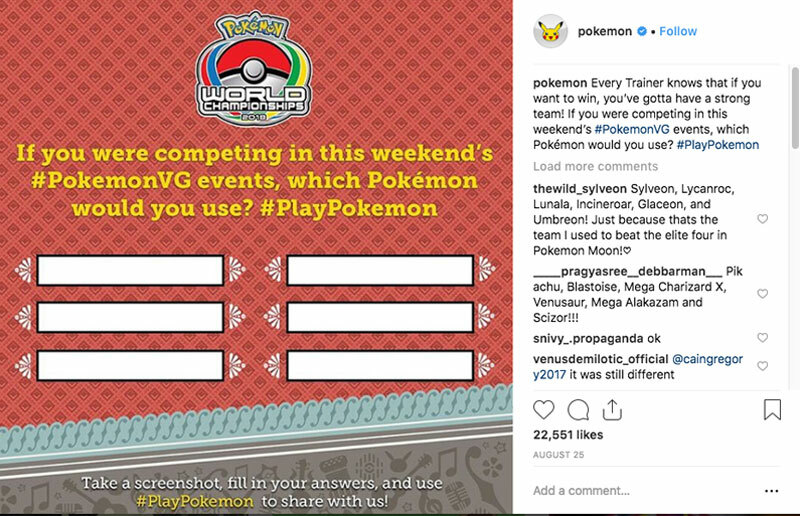 Pokemon uses Instagram Stories, branded content, and runs campaigns whenever they have something new to offer to their audience by following the bio link. Nintendo’s Pokemon runs global events for which they feature behind the scene videos and pictures, and uses questions to super engagement via comments followed by a link in the bio to cross-promote their new features on their game. Pokemon uses the bio link to promote it’s new app Pokemon Duel that lets you build your party of Pokémon figures and play against your friends online. With a built-in store within the app, Pokemon is able to monetize the desire of the players to win the duels by upgrading their heroes thereby increasing the chances of a win. Pokemon uses, Bitly and UTM tags to track the performance of the link and the campaign. Yes, Pokemon uses Instagram Stories. It shows behind the scene action from their events and uses the “see more” feature. Once clicked it redirects to their official channel on Twitch. They feature the winners of the Pokemon world championship in different categories and they use the #playpokemon hashtag. They also feature photos in a Story format from the Pokemon day anniversary. #PlayPokemon #PokemonLetsGo #PokemonCenter #Pokemon #PokemonGO #pikachu They also use hashtags related to holidays, for example, #FathersDay and follow with a question to spur engagement, something like What’s your dad’s favorite Pokémon? Let us know in the comments below! Branded content, user-generated content, Instagram Stories. They seem to run multiple events around the world with the most famous one being the world championship. Being close and personal with their fans allows Nintendo and Pokemon to forge a long lasting relationship with their fans. Via their official Instagram account, they are able to generate branded and user-generated content associated with these events and push them to their global audience. For this, they use Instagram Stories and hashtags. They align the content on their Instagram Account with new features or games available on their website for which they use hashtags and the bio link to further promote their activities. Pokemon has an account on Twitch. They don’t use IGTV at the moment. On average, Pokemon for each post they have on their Instagram account, they get, 20k-90k likes, 200-1000 comments, their videos reach 200k-400k views and they post on average 4 posts/per week. The Tokyo Disney Resort (東京ディズニーリゾート Tōkyō Dizunī Rizōto) is an amusement park and vacation resort which is located in Chiba, Japan, east of Tokyo. The goal of the Tokyo Disney Resort is to provide a sneak peak into the world of Disney to its large audience on Instagram. They use branded content, pictures taken from inside the resort to showcase “how it is, from the inside”. They also ask their fans and audience, should they visit the resort to take a picture and use the #tokyodisneyresort hashtag. They use the bio link to redirect traffic to their official website. They feature branded content in the form of pictures from the most famous spots in the park. They always use the most frequent hashtags associated with the park in combination with the most famous spots in the park for which they have branded hashtags. In addition to featuring the spots, such as the celebration tower or the world bazaar, they feature photos of the most famous Disney characters such as Mickey and Pluto along with their character hashtags. They don’t use Instagram Stories, videos, and IGTV. 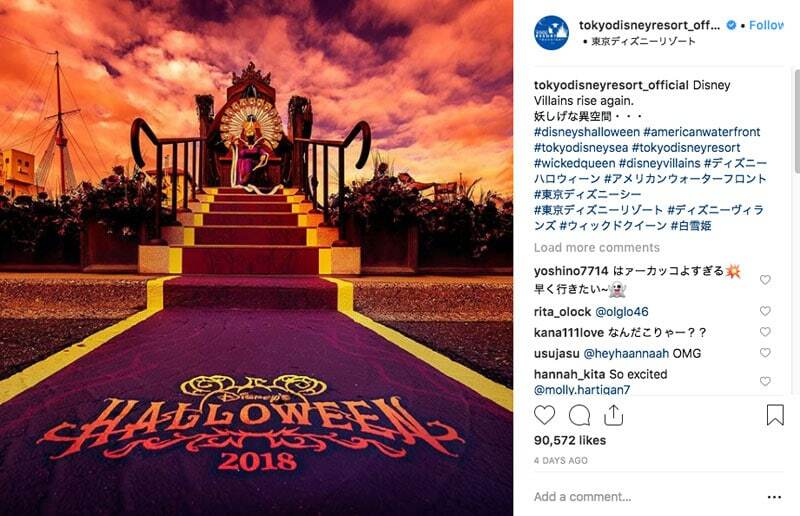 On average, The Tokyo Disney Resort for each post they have on their Instagram account, they get, 100k-120k likes, 50-200 comments, they don’t use videos and they post on average 3 posts/per week. They use the Instagram platform to connect with their audience, create a community around the Tastemande Japan brand, and to promote their website via their bio link. They use video as a key format to communicate their unique recipes. They use the bio link to promote their app where their Instagram audience and fans can learn more about their recipes. To achieve this, they cross-promote the content on Youtube and they use branded hashtags, popular hashtags, Instagram Stories and IGTV. They redirect their Instagram traffic to their website associated with their App encouraging their fans to download the app to learn more. Yes, they use lots of Stories, grouped in Highlights, they feature mostly behind the scene and actual videos of their recipes. For some of the videos and Stories, they use “see more” feature to cross-promote the content on their Youtube channel. Yes, they use IGTV. In total, they have 6 videos, for 5-10 min. All of the videos are associated with their unique branding and way of producing content featuring behind scene and action from shooting the videos with food being prepared based on their most famous recipes. They use branded content in the form of pictures, and videos, packaged into Instagram Stories and IGTV video. Their unique approach is that they always in the caption encourage their audience on Instagram to follow the link in the bio to download the app and learn more. They also use 8 hashtags for every post they make and they add 2 to 3 additional hashtags to describe the food, for example, if it’s a sweet food they will use the #dessert hashtag. 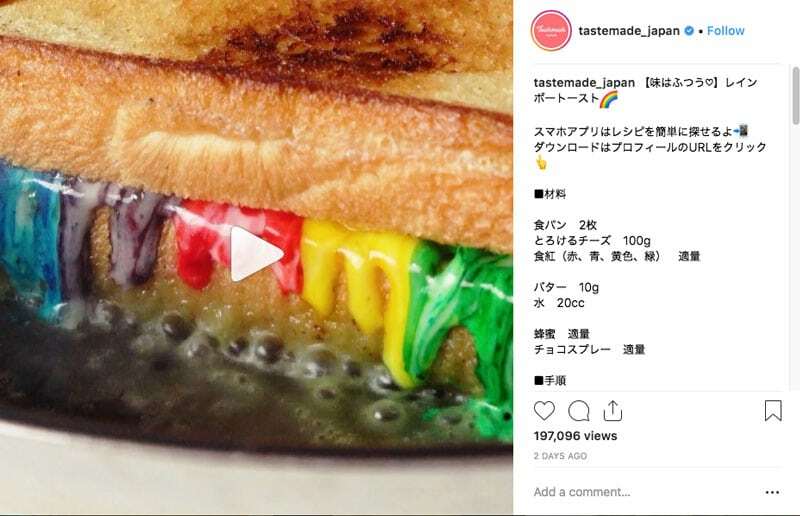 Tastemade Japan uses all features available on Instagram to connect with their audience. They also use Instagram to cross-promote their content on Youtube and also to encourage users to download their app following the link in the bio. On average, Tastemade Japan for each post they have on their Instagram account, they get, 10k-20k likes, 50-200 comments, their videos get 100k-300k views and they post on average 18 posts/per week. Uniqlo Co. Ltd. (株式会社ユニクロ Kabushiki-gaisha Yunikuro) is a Japanese casual wear designer, manufacturer, and retailer. The company is aiming to become the world’s biggest specialty retailer of private label apparel with a continuous growth rate of 20% per year. They use Instagram to promote their latest collections, drive recognition and awareness of their products and eventually drive sales. How do they do it: They use branded content and branded hashtags to push their latest collections, promotions to their audience. They use also Instagram Stories and videos. They use the bio link to promote their special event, an exhibition in Paris, that focuses purely on UNIQLO top-quality knitwear essentials. Yes, they use Instagram Stories. Currently, they have only one Highlight featuring an Instagram Story that promotes the upcoming exhibition in Paris organized by UNIQLO. Mostly videos and carousel photo slides where they showcase more photos of their latest collection. 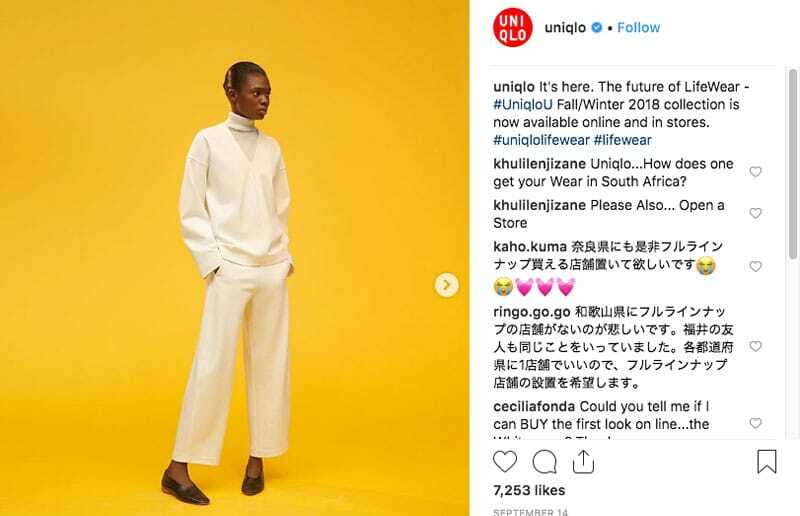 All photos and hashtags are branded by UNIQLO. They feature everyday people from various professions wearing UNIQLO clothes for their latest collection. They tag their accounts, they provide a little intro into their life and profession and they add their branded hashtags in the caption. On average, UNIQLO for each post they have on their Instagram account, they get, 10k-20k likes, 50-100 comments, their videos get 100k-150k views and they post on average 2 posts/per week. A Bathing Ape (ア・ベイジング・エイプ A Beijingu Eipu) (or BAPE) is a Japanese clothing brand founded by Nigo (Tomoaki Nagao) in Ura-Harajuku in 1993. To build a community around their brand in all the countries via local Instagram accounts. They feature Highlights of Instagram Stories for each of the locations, countries in which they have a physical store. In addition to this, they use branded content, pictures, and branded hashtags to engage with their fans and attract new followers. Traffic from Instagram is redirected to their official website. Yes, they use Instagram Stories to feature the official Instagram accounts of their physical stores located in various countries. They also have one set of Stories grouped in a Highlight with a video showcasing their latest collection. Most featured content is branded followed with their most popular hashtag #bape. They also use Instagram Stories grouped into Highlights to promote the official Instagram accounts of their global physical stores from various countries. Their unique approach is featuring their latest collection designer clothes with one single hashtag #bape. They also seems to adopt a more local approach depending on their physical location and they use their global account from Japan to redirect some of their audience to their local country official Instagram accounts. They don’t use Japanese language hashtags and are focused on growing their brand globally. 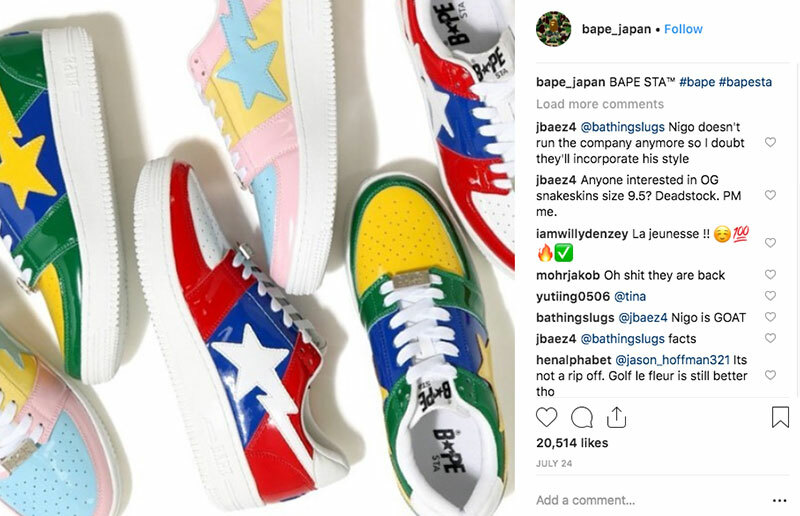 On average, BAPE for each post they have on their Instagram account, they get, 10k-50k likes, 50-200 comments, their videos get 10k-30k views and they post on average 7 posts/per week. For all interested Japanese companies click here to contact our team in Tokyo for more details and questions.